In 1883, when word was circulated that the State of Texas was seeking a location for a second major mental facility and that it would be located in Northeast Texas, the competition among cities must have been quite similar to the quest for industry and other major developments that exist today. Terrell was fortunate at that time to include among the citizens of a still young town a large group of people with the foresight to understand what such a facility could mean to a growing city. 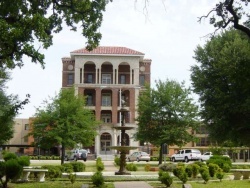 But even the farsightedness of legendary rancher and banker Col. Jim Harris, who gave the necessary acreage to the state for a meager return, could not have visualized the proportions to which Terrell State Hospital has grown today nor the immense impact it has had on the local economy for over 100 years. A total of $200,000 was appropriated for the purchase of the property and construction of the original facilities. It all began, officially, on February 16, 1883, when the 18th Texas Legislature enacted a statute introduced by Judge John Austin. The word "asylum"--by the original definition--was a place of refuge and safety and that, at best, was the primary service offered by mental facilities in the United States at that time. Governor John Ireland commissioned the purchase of 672.65 acres of land located east of Terrell and offered by Jim Harris. This would be site for the branch asylum and the new institution was to be known as North Texas Lunatic Asylum. Its stated purpose was to provide treatment and care for the "chronic incurable insane" of the state's northern counties. John McDonald was contracted as the builder of the new facility and J. N. Preston & Sons of Austin were the architects. Construction was completed and the new hospital was opened on July 14, 1885, with the admission of the first patient. Resident officers were Dr. D. R. Wallace, Superintendent, Dr. F. W. White, Assistant Physician; H. W. Flowers, Steward and Bookkeeper; Clark Griffith, Apothecary; and S. L. Wallace, Matron. Dr. White, who admitted the first patient, later served as Superintendent of both the San Antonio and Wichita Falls State Hospitals. Originally a Board of Directors governed the hospital. The first board included J. S. Grinnan, J. H. Muckleroy, S. A. Shortridge, John S. Griffith and R. M. McClung. During the first year 330 patients were admitted from 46 counties. The next year the number increased to 387 and continued to increase correspondingly through the years. By 1920, the institution had undergone a virtual rebuilding and had grown to a population of 2,300 making it the largest hospital of its kind west of the Mississippi River. None of the original buildings still stand, but the fountain in the circular park--recently repaired and restored to use--remains from the original construction. The plan of the grounds, though much expanded, is similar to the original layout; and the park-like beauty of the grounds has been preserved and enhanced. Constructed in 1927, the present administration building is similar in its multi-storied design to the building it replaced, an indication that hospital architecture changed little during that span of years. Since 1885, the institution has had three names that reflect changes both in attitudes toward mental illness and approaches in treatment. The name North Texas Hospital for the Insane was adopted in 1888 and used until 1925 when Dr. George Powell, Superintendent, requested that the name be changed to Terrell State Hospital. The hospital continued to be governed by a local board of managers until 1920 when the State Board of Control assumed the duties for governing State Eleemosynary Institutions. Starting in 1949, the operation of Terrell State Hospital came under the control and management of the Board of Texas State Hospitals and Special Schools. The 59th Legislature in 1965, under House Bill No. 3, created the Mental Health and Mental Retardation Act for control and management of Terrell State Hospital and other state hospitals. The Board of Texas State Hospital and Special Schools was abolished at that time. There have been major improvements planned and completed at Terrell State Hospital in recent years at a cost of many millions of dollars. The changes, over a period of years, have transformed this pioneer hospital into a modern psychiatric facility that serves 21 counties in the north and northeastern part of the state. This page was last edited on 4 November 2015, at 01:26.